For some years, Safari has been my default browser. I generally prefer its choices in framing and ergonomics and shortcuts over all others. But I’ve had to stop using it. ・Switch­ing from tab to tab is slug­gish, and when the sys­tem gets over­loaded, you get a lot of gra­tu­itous re­paints. ・The WebProcess and Sa­fari processes fea­ture promi­nently in read­outs of what’s con­sum­ing the sys­tem’s CPU and mem­ory. ・When you have a few dozen tabs open, some of them for days, and some of them being full of dy­namic code, the whole sys­tem gets in­creas­ingly slow and un­sta­ble. I’m seeing the same things Bray is with Safari for Mac, particularly the performance problems when you have a lot of windows and tabs open. I’m not ready to switch yet, but I’m starting to shop around. And if anything, Safari 5.1 seems worse on Lion than it does on Snow Leopard. Annoyed by Safari 5’s tendency to spontaneously reload pages when you didn’t ask it to? There’s a workaround for it, but it introduces a few problems of its own. Some Safari extensions will not work, and some of the new gestures won’t work either. 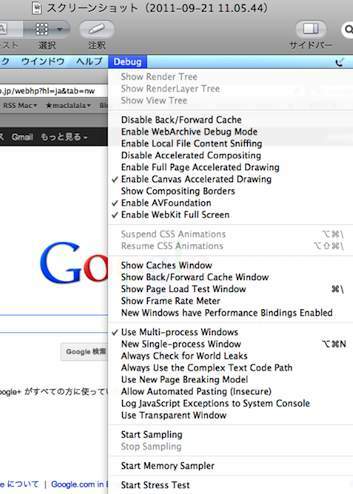 What you do is enable Safari’s hidden Debug menu, and turn off the on-by-default “Use Multi-process Windows” option. I ran Safari like this for a few hours yesterday, and it seems to help with Safari 5.1’s general sluggishness (when you have a lot of windows and tabs open) too. But that fact that most Safari extensions (or at least the ones I care about) no longer work in this mode is a deal-breaker for me. What I’m trying today is switching to the WebKit nightly builds. So what is a “multi-process window” anyway? One of the new features in Safari 5.1 is a major new version of the underlying engine — WebKit2. Under WebKit2’s new process architecture, Safari consists of two separate processes — the “UI process” (the Safari application itself, including the address bar, toolbar, bookmarks bar, menus, etc. ), and the “web process” (an independent process that loads and displays actual web pages). We have some exciting news for all the HTML5 enthusiasts out there: true HTML5 fullscreen video playback is now possible, and we’ve built it right into our player. Until now, the lack of true fullscreen playback has been the biggest limitation of HTML5 over Flash video. Safari already offered a basic fullscreen option for HTML5 video players, but this was via a non-customizable QuickTime view that didn’t allow the player to be branded or to feature custom controls. For the first time since we demoed our player last year, we can finally enjoy SublimeVideo’s HTML5 controls in glorious fullscreen. This is a cutting-edge feature and we are breaking new ground by being the first video player to implement it. Right now it requires the very latest version of Safari 5.1, but Chrome and Firefox support should arrive soon1. Click on the fullscreen button or double click on the video to enter fullscreen. We’ve now enabled this feature on all instances of SublimeVideo Player. However, because this is a brand new feature that is currently only available in Safari, for now we have left the traditional full-window behavior as the default player option. If you are running Safari 5.1, simply hold down Command (Mac) or Ctrl (Windows) while clicking the player’s full-window button to enjoy true fullscreen HTML5 playback2. You can also double-click the video whilst holding the modifier key to activate fullscreen. You can test it yourself on some of our customers’ sites! Stay tuned for more SublimeVideo news and developments. 1. The WebKit/Safari fullscreen implementation is actually based on Mozilla’s Fullscreen API Proposal, so hopefully this will soon be added to Firefox; you can add your voice and push for this feature on Firefox via this thread. 2. If you are a SublimeVideo customer and want to enable true fullscreen playback by default on supported browsers as we have in the video above (i.e. without needing to hold down the command/ctrl key) you can do it by adding the sv_html5_fullscreen class to your elements.